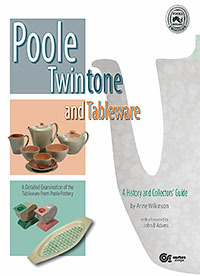 The book was successfully launched at Poole Pottery on 25th April 2009. Anne signed many copies to several happy Poole collectors: see photos. A new book by the site owner on the compete Tableware range of pottery. If you are a collector of this amazingly svelte pottery range, then Poole Twintone and Tableware is an absolute must. Every colour, shape and pattern, and all the backstamps are illustrated and examined in detail. Foreword by John B. Adams. 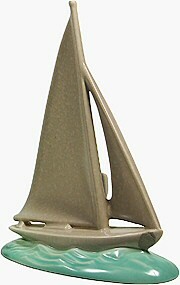 Poole tableware from the 1920s to the twenty-first century. all the Twintone colours and shapes. fully illustrated, and documented from contemporary sources. more than 70 glazes identified. more than 180 patterns illustrated. over 20 tableware shape designs described and explained. with co-operation and support from the Poole Museum, the Dorset History Centre, The Potteries Museum and the Lifestyle Group. extracts from the Poole archives. John Adams, Harold Stabler, Truda Carter, A.B. Read, Robert Jefferson, David Queensberry, Anita Harris, etc. 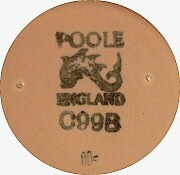 A typical backstamp showing the familiar 'C' number.